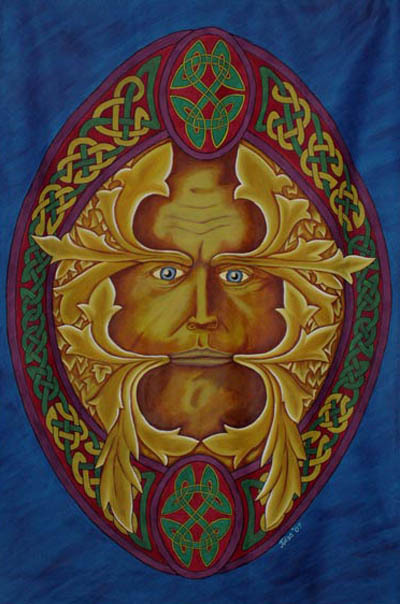 The Green Man is primarily interpreted as a symbol of rebirth, representing the cycle of growth each spring. 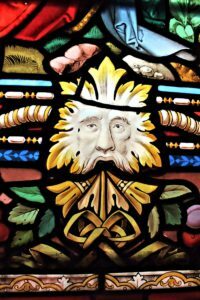 Some speculate that the mythology of the Green Man developed independently in the traditions of separate ancient cultures and evolved into the wide variety of examples found throughout history. This painting came through me just before the Sojournal was born with the 2008 edition. The Green Man has always been the logo for the Sojournal, though the face has changed, the essence remains. Just as the elemental theme is the basis of the creative content, so is the awareness of us being the guardians of nature. 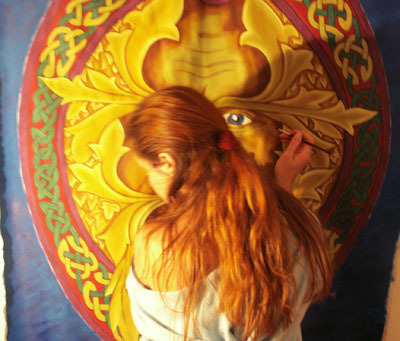 The discovery of the Green Man, is forever unfolding as we connect our personal practical experience to the ancient knowledge, while embracing all aspects in our modern daily life now. Myths and legends were born then, NOW is our time to determine NEW interpretations of this ancient knowledge, incorporating it into our Unique life experience, never experienced before on earth, as we know it. 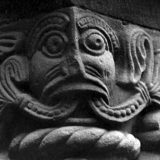 Often referred to in works on architecture as foliate heads or masks, the Green Man may take many forms. Some may have leaves for hair, perhaps with a leafy beard, or shoots are shown growing from his open mouth or nose or even the eyes. In the most abstract examples, the carving at first glance appears to be merely stylised foliage, with the facial element only becoming apparent on closer examination. The face is almost always masculine. 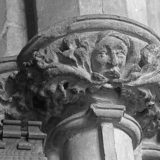 Superficially the Green Man would appear to be pagan, perhaps a fertility figure or a nature spirit, similar to the woodwose (the wild man of the woods), and yet he frequently appears, carved in wood or stone, in churches, chapels, abbeys and cathedrals, where examples can be found dating through to the 20th century. 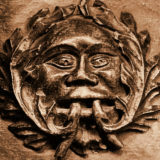 The earliest example of a Green Man disgorging vegetation from his mouth is from St. Abre, in St. Hilaire-le-grand, c. 400 AD. The Sojournal shifted from the serious Green Man father figure, to a young androgynous child of the new earth, from the 2011 edition. This image has stuck as our logo ever since. This child (a photo of my daughter at 3 years old) has a special kind of expression, one that watches you with knowing innocent eyes, saying “this is our world you are leaving when your story is complete, we arrived with a new way of being and have a special purpose here”. We are the Guardians of the Future, tread lightly and carry your staff of Power as you walk in Truth. Often images, signs and messages come to us, and grab our attention, when we need to harness the wisdom and discover the power of it’s meaning. Right now, in the fire stricken Garden Route, the Green Man is calling to be acknowledged and empowered through the people. Along with the people who lost their homes, Nature as been stripped to the core, where in our naked vulnerability we now must explore and ask ourselves “who am I” and “how are we connected to nature”. It’s time to tap into simple tribal teachings to guide our way.